I sautéed the onions for two minutes in olive oil, then threw on the bell peppers and tofu, followed by the carrots, then broccoli, and finishing it off with the cherry tomatoes and snap peas together. Cook each vegetable for two minutes before adding the next one, then after you add the cherry tomatoes and the snap peas, just cook it all until it looks done. You’ll know it’s done with the onions begin to brown a bit, and you can stick a fork through the carrots and broccoli. You can of course add any other vegetables that your heart desires. If you wanted to add mushrooms and green beans, I would put them on after the broccoli. Once everything was done, I added the seasonings to taste, and thew in the nuts and avocado too. If you don’t like nuts, tikka masala is a great alternative to the Thai peanut sauce. 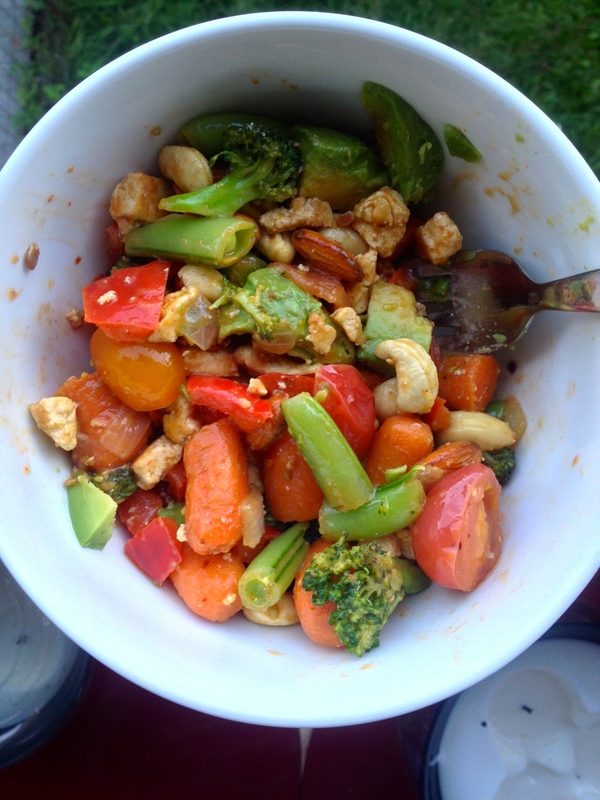 I like adding some almonds and cashews to the stir-fry to add more of a nutty flavor and some more protein. This was my first time putting avocado on it, and I think its creamy texture gave my stir-fry the extra oomph to be better than it normally is. A bowl of this will leave you feeling stuffed from the protein and denseness of the vegetables, but also feeling great because of how healthy it is.